Distinguish your event from all others with a custom monogram from La Belle Fete. Nothing celebrates the joining of two lives quite like the timeless symbol of a monogram; be sure yours is as unique as you are! 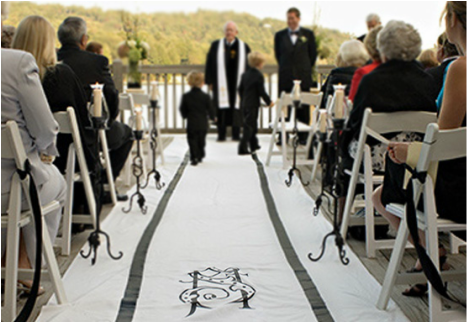 Apply your custom monogram to your invitations, programs, placecards and personal stationery, rubber stamp your monogram as an envelope seal, send it to your confectioner for displaying on your wedding cake, or have it digitized for embroidery for handkerchiefs, aisle runners, or even your veil. The applications are limitless, and the statement is timeless. We invite you to view examples of some of the monograms we've created in our GALLERY. Image by Woodward + Rick Photography, Inc.